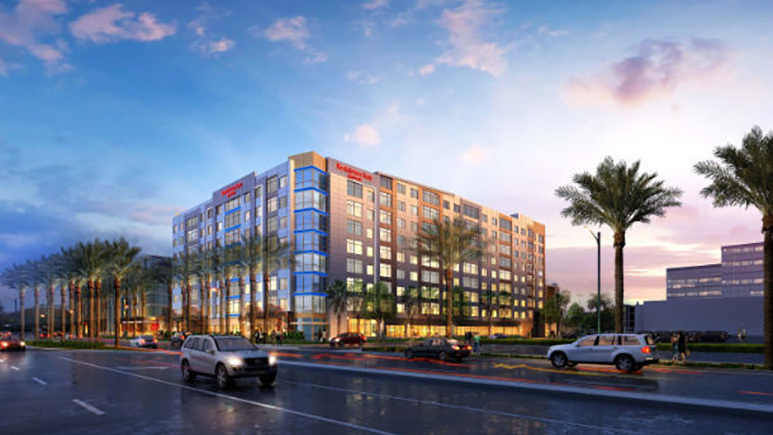 Stay at the newest Residence Inn near DISNEYLAND® for a comfortable and memorable vacation. Spread out in your spacious suite and use the hotel’s free grocery shopping service to cook in your in-room kitchen or the public BBQ area. Enjoy a free hot breakfast each morning and cool off each afternoon in the roof-top pool and children’s splash area. 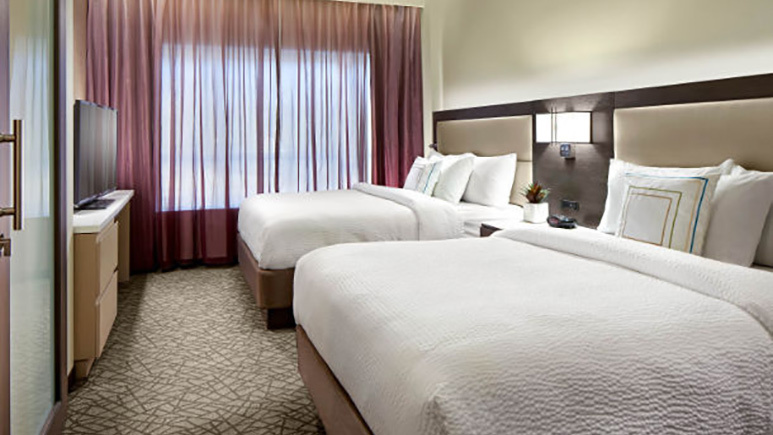 Maximum 1 pet per room, Non-refundable fee: $150, Non-refundable fee for additional pet: $20 per night, Pets up to 45lbs with $150 Non Refundable fee per stay. I did a lot of research to find the perfect hotel for our family of 7 - 4 adults (age 60's & 30's) and 3 little kids. We stayed in a 2 bedroom/2 bathroom suite with kitchen. We walked to Disneyland each of the 5 days and the walk was only far the last night we stayed late - the kids were exhausted and the stroller was extra heavy. Other than that the distance was good for us - not too far to come back to the hotel for a few hours in the afternoon and return to Disneyland for evening festivities. The full breakfast in the morning was really great. The pool and hot tub on the roof were nice, except for 1 night the hot tub was cold - brrrr! The kids really liked the bunk suite with bathroom and we enjoyed having a separate room with bathroom for ourselves. The only thing that wasn't perfect was the view. It would have been nice to have been able to watch the fireworks from the room, but I wasn't willing to shell out the ridiculous amount of money the hotel wanted for a suite with a view. The rooms were set up well and the entire family felt comfortable whether we were in our rooms at breakfast or poolside. We were thrilled with the Residence Inn. The breakfast had everything you would want, the rooms were spacious and clean, and the staff was very friendly. I like how close the hotel is to Disneyland walking distance. The hotel is modern and looks new still. The room has everything you need and it was a great size for my ffamily of four. The free hot breakfast was superb and super convenient. The personnel was friendly. My only complaint is that the cleaning of the room could have been better. The first day we used the shower it was clogged but the next day it was working perfectly. I think the cleaning staff rushes thru the cleaning but our room got cleaned daily and that was nice. The bed and pillows were super comfy and sheets were clean. The pool was super nice and my kids enjoyed it. I would defiantly stay here again. Upon arrival we were disappointed with a couple of things, it didn't feel like the bathrooms had a very good cleaning after the previous guests, we had the bunkbed suite and were very disappointed that the bunkbed room didn't have a door, it is located right off of the kitchen so our plans of being able to get things ready for the next day after the kids were asleep didn't work. The entrances to both bathrooms are through the rooms, we hoped that at least one would be through the living area. The breakfast was nice as long as you get there early enough before it gets too crazy. Overall it was a nice hotel and a good place for families to stay, a 10 min walk to Disney, nice pool area. The parking situation does make unloading and reloading a bit of a pain - but everything is a bit of a pain when you take young kids to disneyland. I would recommend this hotel, we slept great in the beds, the sofa bed was very springy . . . so we ended up not using it. It is likely we will stay here again. We had 3 adults and 4 children in the kids suite and it was awesome. The room never felt crammed, it was nice and updated. There were tv's in every room and two huge bathrooms, plus a kitchen. My kids loved the pool, hot tub, and splash pad. The walk to Disneyland was easy, we would come and go throughout the day and the walk was only 5-7 minutes away. The free breakfast was AMAZING. They had delicious belgian waffles and fresh fruit, bagels, sausage, eggs, oatmeal... all kinds of things and plenty of beverages to choose from. My whole family looked forward to going downstairs to eat everyday. We will definitely stay here again. We read several reviews that commented that they did not get the room that they had booked. To make sure that we got the roomed we booked, I called the hotel 2 days before we arrived. They indicated that could not guarantee your room until the day of our arrival. So I called that morning to confirm. Sure enough, when we got to the hotel, they were out of the rooms that we had booked. The staff was helpful but could not fix the situation. We ended up with a king bed and sofa instead of 2 queens and a sofa. Other than that, the rooms are small. With the sofa bed out, there was no room in the living area and it was difficult to go from the bedroom to the other room and the sofa bed blocked most of the door. The closet area and dressers were very small for more than 2 people. The hotel is new, clean and well located. The beds were comfortable, room was clean, and they had a lot of food and drinks to choose from at breakfast. 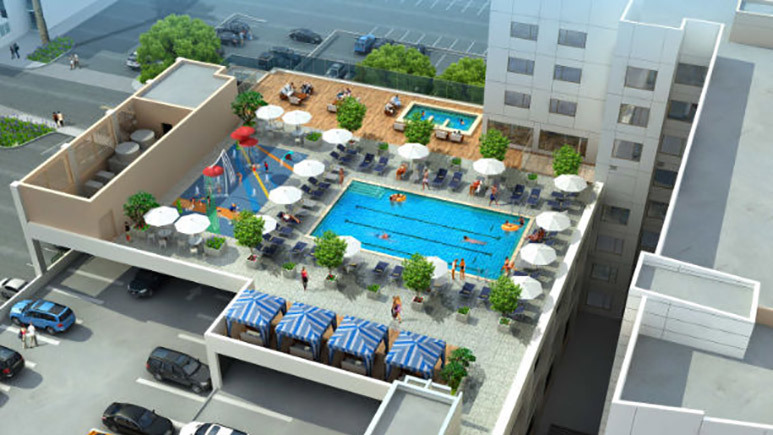 They also have a great pool with a big hot tub, splash pad and fire pits. Our room was new and clean. There is construction on one side of the hotel but we never heard it; our room was very quiet. The only thing that we would have liked was more space for clothes and kid's "stuff". Do NOT be fooled by an "upgrade"
We were so excited as we had read great reviews about this hotel. We traveled with our two daughters and two nieces. I called ahead the morning of arrival to notify them that our flight in was fairly late and to not give away our room. We had booked and paid for the kids suite. The gentleman said it would be no problem. We arrived about 11pm and were told that they had overbooked on that room and we had been "upgraded" to an executive suite. We then took the girls to get something to eat getting to bed after 1:30 am. We were woken up by 5:30 am by people exercising above us and if that were not difficult enough then the construction right outside the window was super noisy. Luckily the construction was not an issue for the next two days as it was then the wesekend. We discovered that the fitness room was right above us. You could hear people running on the treadmills and every time anyone set down the weights. We were so tired from playing at Disney all day and just wanted to be able to sleep. Every morning between 5-5:30 it was impossible! I had enough and called the front desk only to be told they had no where to move us and I would have to speak to a manager. The manager that came on was very nice but the best they could do was put us in separate regular rooms. This split us up and was inconvenient with our snacks etc. It was just disappointing and even more so because of how tired we all were. It was an exhausting vacation. The breakfast was nice but it is the same stuff every single day. Also one of the rooms we were moved to was dirty. There was sticky stuff spilled on the kitchen floor and something gross on the towel bar on the shower door. I really wanted to like this place but it was a letdown. We had a fabulous stay and very much enjoyed our time at this hotel. Very clean and new. The beds were comfortable and the linens were soft and clean. They were also very generous with the towels. We made good use of the kitchen to save money on food. The free breakfast was also a great money saver. It is a quick walk to the park entrance (less than 15 minutes even after a long day in the park). The pool and hot tub were nice as well. I would highly recommend this hotel for a family Disney vacation. This was a very nice hotel, my kids loved the bunk beds. The breakfast was a typically buffet but good. It is within walking distance to Disneyland or a $10.00 cab ride. Would definetely stay here again! This hotel is clean, friendly, the pool is awesome, and the breakfast is great! This was the first time I have booked a hotel myself so I was a little nervous but it went flawlessly. It is super close to Disneyland so we walked all 3 days with no problem. I would definitely stay here again next time we go! I really hate to give away a good secret!! This was our first trip to Disney Land. We were traveling with two toddlers and were looking for an affordable motel within walking distance to the park that had a possible second bedroom for the kids. All of the motels exceeded our budget that had a second room option except for this one. With this being a newer motel with no reviews and the pics for the room were pretty basic I went on a whim and booked it. 2-Bedroom kids suite. After spending 8 hours traveling from Las Vegas in Holiday California traffic to make it here, it was a delight to say the least walking in the front doors. Lobby was very clean and the staff were great to work with. Once we got checked in and made it to the room we were amazed by the room set up. The kids had their own side of the room opposite of ours that had their bunk beds and own bathroom(which by the way on the other side of their wall was a storage room so we did not worry about them being too loud and making the neighbors mad). The kitchenette had every amenity you would need. Maid service was great as well. The pool area I would give a 20 out of a 1 thru 10 rating!! Has a large hot tub to soak your exhausted body in from walking around the park all day while the kids have a large pool and splash pad area to play in. Though you can’t see the Disney fireworks from the pool level, it has a seating area with fire places that you can watch the light show at adventure land from a distance. The free breakfast was awesome, you have a CVS and Walgreens within a couple minutes’ walk, a full service bar in the lobby, and your only a 15 minute walk from the park entrance. If I was to book to book this trip tomorrow, I would book this hotel again! !